Taiwan: Life, love and laughs in paradise. In Part One the main thread of the post was dedicated to the silly old Alexander letter. Reason for that being that it was the first glimpse I had of folks who think that South Africans are somehow less qualified to teach English than say, Canadians or Australians, and that South Africa may be perceived as something other than an English speaking country like, the USA or Britain. The Dragon Recruiters information file I received prior to arrival had one thing right, we are low on the list. The preference is as follows: USA, Canada, Britain, Australia, New Zealand and South Africa. Schools invariably state; North American accent preferred. The preference can change, as some schools prefer Canadian teachers and I have had one or two offers where the school actually preferred South Africans. In the case of the latter the age old reason was given (that is preached high and low in SA) for why foreign shores seek SA professionals; they are hard working and don't complain. I wasn't aware that the number of teachers had declined; do you have info on this? I live in Jiayi and the number of foreigners has increased over the last five years. Many small cities that were once without big-noses now have several (usually South Africans). You're right about the South African thing though, some I've met can barely speak English. That just shows how stupid the schools are. Sorry, nothing personal against you Alleycat. It's just that I recently discovered another school that has 8 S.A teachers. 5 of them could barely hold a conversation in English - Another S.A teacher translated from Afrikaans so other people could understand what they were saying. In meetings they speak Afrikaans, and when the boss says that he can't understand, they say "Oh, we'll speak slower for you" , and then they changed to simple English. I am not saying that it is all S. Africans, as Alleycat is obviously a class act and a top notch English speaker, but there are some, usually hiding away in small towns. In these small towns they make a tiny salary and are happy, but is this acceptable????? If I were a parent of one of the kids at the English school where they teach I would not be happy. Actually they didn't even pass the required test for their school, but the boss was greedy and needed a foreign face. I had better add that many South Africans are excellent English teachers and I am glad to count some of them as friends, but even my S.A friends admit that there are many out there spoiling it for the rest of them. SA Citizens Getting a Hard Time. What I want to know is: has anyone had any similar experiences or know the reasons for the treatment that South Africans (I really hope its not only me) seem to be receiving at the moment? Is there some devious South African ring conniving to send terrible teachers to Taiwan and sabotage the spread of the English language in Taiwan? There seems to have been a decision taken in the dank halls of power that South Africans are no longer welcome in Taiwan and every effort should be made to root them out and send them back to darkest Africa where they belong (interminable rant deleted for brevity)...Every South African I know who has been trying to get an ARC has encountered obstacle after obstacle in what used to be the simple process of getting an ARC and work permit to teach English in Taiwan. I am hiring teachers for several Taipei schools. Recently, we were handed a memo from the Dept. of Education that didn't say we couldn't hire South Africans, but said to "use great caution" in hiring South Africans because of the unusually high number of fake diplomas that have recently turned up among them. I'm afraid the source of all the trouble is the actions of a few bad eggs. We ourselves would like to hire some South Africans, but have run into various snags. Could it be that South Africans accent is not the preferred accent that Taiwanese parents want their children to speak? Finally, could it be that there is not much understanding of South AFRICA by some people who think it is a backwards poor African country when in fact we all know it is not. If the teacher does not have a good level of English is it just tough luck for the school? I have a South African friend who told me that many Afrikaans speakers in Taiwan have difficulty conducting a conversation in English and yet are English Teachers. If, like me, your native language is English-both parents are of British descent-then you were placed in the system with English as your first language and Afrikaans as your second. Give these guys a break. The Taiwanese government does not understand, and, as long as they don't, any South African passport holder with a degree has every legal right to be here teaching English. Besides, "times are tough" in South Africa. Taiwan is a fascinating country and an economic opportunity for them, as it is for me and some of you. Yes, I am not happy that although I am a native speaker and speak clearer than many Americans, Canadians, Englishmen, Australians, New Zealanders (the order of preference among hirer's), I am still, because of my SA passport, ranked with Afrikaners in the job hunting game. Thank god, however, I am out of that racket. I find it really difficult to believe some South Africans have trouble speaking English. It's our official language. If there are, however, surely, during the interview, you would be able to tell, even if the person is an Afrikaner, whether he or she is able to speak with enough fluency to teach English. And that things have recently become complicated in getting teachers from S.A. My S.A colleague suggested that this may be the problem. He said 70% of his countrymen that he has met in Taiwan have appalling English. Obviously, from your reply, this is not the case at all. Yes, it is easy to tell from a conversation on the telephone, however there are some agents who don't allow contact - this makes me more than a little suspicious. Back to entry complications - S.A people now require a local guarantor before a visa will be issued even for a tourist. Is this because S.A did the dirty politically on Taiwan or is it because of some other problems? I find that some South Africans are very critical of the "Afrikaner" accent. Grammatically there might be nothing wrong with some body's English, but it could still be viewed as inferior because of the accent. However, anyone matriculating from a South African high school without being able to speak near fluent English is not going to be able to function other than as a day laborer, as all business, public and private, is conducted nowadays almost entirely in English. I, therefore, cannot understand how a graduate of a South African university, be it UCT or RAU, is unable to conduct a conversation in near perfect English. Even I have railed against the influx of Afrikaners, but considering how bad our economic situation is and, yes, the reverse discrimination (sometimes called affirmative action) in South Africa, I cannot with a good conscience denounce anyone who has a legal right to be in Taiwan. Can you? The discrimination against South Africans is mounting in Taiwan. If we don't do something about it ourselves, it will never stop. The only way around it will be to ensure that the Taiwanese in South Africa experience the same difficulties. Trade between South Africa and Taiwan is up, in fact, it's better than ever before despite the ending of diplomatic relations between the two countries in 1997. They cannot have it both ways. It was South Africans who helped to boost their economy in the 70's and 80's when they needed it most. We welcomed not only their business, but also their citizens. That is something that they would do well to remember. After the ANC broke off diplomatic relations with them, it was the various opposition parties in South Africa that elected four Taiwanese into their parties and then immediately to parliament as MP's. As far as the fake degrees are concerned, there is no way that that can be the real reason. First of all it is their responsibility to check the qualifications of everyone who enters their country and job market. Secondly, most Americans and Canadians enter Taiwan without degrees. You will recall the TV series, "Taipei diaries" where the Canadian teachers admitted that they only held high school qualifications. That never bothered the Taiwanese authorities. Another reason that is cited is that the accents of South Africans are difficult to understand. Children more often complain about Australian and New Zealand accents than South African accents. It can definitely not be our accents either. This blatant discrimination against people who have only ever supported Taiwan has to do with politics. Quite a few South Africans are rotting away in Taiwanese prisons, people like Luther van Zyl. South Africans are being arrested and jailed just because they dared apply for a three month visa. South Africans can only apply for 30 day visas, but nobody tells you that you dare not apply for more should you have to go to Bangkok or elsewhere for an extension. These tyrannical measures are directed only at South Africans and are in my opinion, due to the fact that Taiwan is trying to get into the ANC's good books. We have become pawns in a bigger political game, and are no more than acceptable sacrifices to these forces. I would like to invite anyone to join me in writing a well researched article to be sent for publication in all three SA Chinese newspapers, as well as newspapers in Taiwan. I would also like to arrange a meeting with the Taipei Liaison Office in Pretoria to discuss the issue. You can email me at: jl70.schutte@gmail.com, or Skype me. Do you know what i think? People just want to have an issue with S.A. people. Leave them alone. I'm not a South African person. But I knew a lot of their kind. Some people don't know that some americans and canadian didn't graduate in their school, too. School just accepted them because they are white. When I taught in Taiwan about 10 years ago, I met many an American or Canadian who had no formal post-school training. There was even one guy who came from Canada where he was a road worker. I was also surprised that the University of Alberta had degree certificates that were on A4 paper! Then there was the American who was a qualified bee-keeper, or apiarist, and the woman with a chemistry degree but who could not even read the chemical names on a Panado box!Yes, there have been some South Africans who have given us a bad name, but, I was not surprised to see most of the Canadians I shipped off back home in 2004. 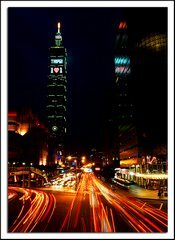 A beautiful night shot of the world's tallest building in Taipei, Taiwan. Taken by a Taiwan foreign resident, Craig Ferguson. For more amazing images by Mr. Ferguson, see link below. I don't like to describe or define myself. The only way to know more about me is to get to know me.